Help green our watershed, cities and towns while making your yard more beautiful, naturally! CVC’s Your Green Yard program provides workshops and other resources to assist you. Your Green Yard focuses on ecological landscaping and gardening. This includes three types of activities: native plant gardening; environmental maintenance; and, green outdoor building. You can take simple steps, such as planting native trees, shrubs and wildflowers, or switching to a low-maintenance lawn. You can also try something more challenging, such as installing permeable paving or a rain garden. CVC is here to help! People are concerned about global climate change, loss of species and other environmental problems. Although the task of restoring a healthy environment can seem daunting at times, we can all participate in small or larger ways. In the urban areas of the Credit River Watershed, residential properties cover over 40% of the land surface. Every yard can make a difference, and many yards together can contribute significantly. Greening your yard can provide shade and cooling, help clean the air, protect native plants and animals, and help keep our water and soils clean and abundant. You can also save on maintenance costs, water and energy use, while making your yard more beautiful and interesting! Consider planting native edible plants, such as raspberry and serviceberry – for yourself or for the birds! Help spread the word: demonstrate ecological practices to your neighbours! 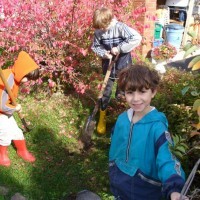 If you live in Mississauga or Brampton*, watch for a Your Green Yard workshop coming to your neighbourhood soon! Or, give us a call and arrange for a workshop in your neighbourhood. You can also invite us to present to your garden club, service club or other group! * Available on a more limited basis in other towns in the watershed. Workshop participants can sign up for a free native tree or shrub. Your plant is delivered to you and our staff will help you plant! Watch our website for fact sheets, resource lists, garden tips and more! The Region of Peel and Cities of Mississauga and Brampton provide additional resources. Peel also offers rain barrels for a minimal fee. See CVC’s website for links. For more information about what you can do check our website for fact sheets, native plant lists, invasive species lists, and more! Enhance watershed health at home and at work! Ask about our Greening Corporate/Institutional Grounds Program.